Lizards, LLamas, and Lots of Fun! Pet Day is one of the most popular annual events in Corvallis! There are lots of fun activities including a petting zoo, teddy bear surgery, dog wash, dog agility demos, veterinary hospital tours and more. Numerous booths will be staffed by vendors and volunteers who provide information on animal health and wellness, nutrition, adoption and therapy. Other booths sell animal-related products and gifts. We also have llamas, goats, greyhounds, and ponies! Pet Day is created, organized and staffed by students in the College of Veterinary Medicine at OSU. It is their way of giving back to the community and continuing a legacy of public service at the college. So come on down to the corner of 30th and Washington street on the OSU campus on Saturday, May 4, 2019 10 am - 4 pm. Pet Day is free and open to the public. A few activities like the Fun Run and Dog Wash have small fees (cash only). PET COSTUME CONTEST - Register Here. Do you have fun, adorable photos of your cats? Send them to OSU Pet Day where visitors vote on their favorites, and the top two vote-getters in two CATegories (best costume and cutest cat) win prizes! Cat photo contest flyer. 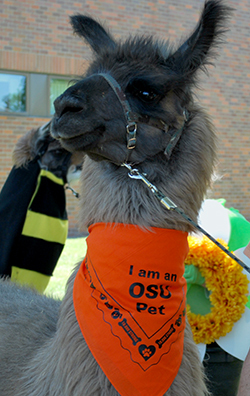 Email your photos to: petdayphoto@oregonstate.edu. Be sure to include your name and cat's name. Deadline for submission is Sunday, April 28th, 2019. Kick off the Pet Day fun with with a Star Wars-themed 5K Fun Run, Saturday, May 4th at 9:00 AM. Early registration is $20 and includes a Fun Run t-shirt. Register online here. Please fill out this Waiver of liablilty and bring it with you to the fun run. Prizes will be awarded to top finishers, and post-run/walk snacks & water will be provided! Follow our FaceBook event page! In the spirit of Star Wars Day, costumes are encouraged at this event. Invite your friends and family and come enjoy a jog or walk with your dogs through the beautiful Oregon State University campus. May the Fluff be with you, always! Please Support Our Industry Partners!